Thomas Haelig Buhl, 86, of Gettysburg, PA passed away peacefully at his home, Friday, January 25, 2019. He was born August 4, 1932 in Brooklyn, NY the son of the late John E. and Emily Haelig Buhl. Tom was a graduate of Lehigh University and served in the US Army during the Korean Conflict. Tom was active in his church and the Knights of Columbus. Mr. Buhl is predeceased by his first wife, Doris Marie Buhl and survived by his wife, Mary T. “Terry” Harris Buhl and his daughters; Pamela Buhl, Elizabeth Buhl-Howard and her husband Jack, Marie Ouimette, four step-children; Paul J. Sears, Laurie Sears-Deppa, Julie Lawson, Heather Sears-Boyton, 15 grandchildren, 7 great grandchildren and a brother, John E. Buhl and his wife Patricia of Bethesda, MD. A Mass of Christian Burial will be celebrated Monday, January 28, 2019 at St. Francis Xavier Catholic Church, High Street, Gettysburg at 10:00 AM with Fr. John Kuchinski celebrant. There will be a viewing at the church on Sunday, January 27, 2019 from 4:00 PM until 6:00 PM. In lieu of flowers memorials can be made to the Alzheimer’s Association, 2595 Interstate Drive, Suite 100, Harrisburg, PA 17110. 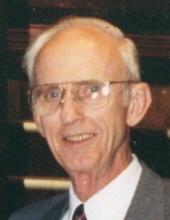 "Email Address" would like to share the life celebration of Thomas H. Buhl. Click on the "link" to go to share a favorite memory or leave a condolence message for the family.